Today I am so excited to share with you an engaging and entertaing interview with Angie Richmond. 1. What hockey team are you a fanatic about? Who’s your favorite player and why? I love the Vancouver Canucks! I can't exactly pinpoint the moment I started liking them, but I know it was in the 90s and the goalie Kirk McLean had something to do with it. My current favorite player is Kevin Bieksa. Funny story...my husband Brandon and I were in Vancouver to see a game and we decided to do some pre-game shopping at the Canucks store the day before. I headed straight for the Bieksa t-shirts then made my way down to pay. As I descended the stairs I came face to face (well face to side) with Kevin Bieksa himself. I was so stunned that I somehow stumbled up to the till to pay and left without even asking for a picture or autograph. Oh how I regret THAT day! 2. Where, or from whom, do you find inspiration for your creativity? I can't say there's one specific thing that inspires me. It's a combination of various things. Sometimes it's a word, a picture, a person or a dream I've had. I try to let anything and everything inspire me. BUT, if we are talking people, I'd have to say the person I most look up to is Viggo Mortensen. He's a true example of a well rounded creative. 3. How did you come up with the idea for 22 Things? What do you hope everyone achieves by making their list? 22 Things was born from a moment of unhappiness. I found myself on my lunch break sitting at the library feeling overwhelmed by unhappiness. I felt stuck. I felt hopeless. I had this idea of what I wanted to do with my life, but it felt so darn daunting that I couldn't even imagine making any changes. Then an idea struck me. What if I could change a few small things, nothing too huge, but just enough so I wasn't stressed out. I started listing items I wanted to keep in mind or try. At the end I had a nice list of 22. I emailed a friend to share my list and she encouraged me to blog about it. Call it 22 Things, she encouraged. And I did. It kind of took off from there. My hope is that people will sit down, listen to their heart and take steps to find their own happiness - one small step at a time. 4. What author would you give your left pinky to spend the day with? Why? J.K. Rowling because she wrote Harry Potter, which - let's face it - is amazing! Diana Gabaldon because I'm convinced that her Outlander series MUST be based on fact because no one can write such an amazing, all encompassing series that spans an entire life off the top of their head. And if she did..WOW! Jane Austen because I'm dying to know if she ever kissed a man. There's just so much that's unknown about that woman! 5. You have to write the best you’ve ever written. What music do you reach for? To be honest I usually write in silence, unless I'm at Starbucks, then whatever they play. IF I did happen to have music playing, it's classical; anything without lyrics. Lyrics mess me up when I write. I'll be halfway through a sentence before I realize I've just written the words to a song. 6. What is your favorite genre to read and which genre do you write in mostly? Another good question! I tend to read a diverse mix of genres depending on how I feel. Though I do tend to stay away from chick lit. I prefer danger, disaster and suffering. Anything with a psychological twist also makes me happy. My writing tends to follow along the same lines. 7. If you could have one thing British what would it be? 8. What do you think the recipe is for creating a memorable novel? Really believable characters. When I'm reading a novel and I can imagine myself in their shoes or want to be them, then it's perfect! 9. You get to become one literary character for a day. Who’s it going to be? Oh wow, another hard question! Probably Claire from Diana Gabaldon's novels. She gets to time travel and marry a highlander...need I say more? 10. How old were you when you began painting/drawing? Do you have a favorite? I can't remember exactly. I've always enjoyed making things and crafting. I used to draw a lot when I was a teen. It's only very recently that I began experimenting with art again. I'm quite proud of a farmhouse I sketched more recently. It was from a learn-to-draw book and it turned out pretty nice. It was my first attempt to draw something that detailed. 11. What does living a creative life mean to you? It means everything! I've spent so many years dreaming of "being" creative without realizing I already WAS creative. Now I try to approach my life with creativity in mind. My hopes are that I will eventually support myself with my creativity, while helping others find theirs. A self proclaimed creative, Angie Richmond divides her spare time between writing, blogging, reading, and creating art. Her formal training in Psychology, combined with her desire to help others find their creative passions, has led her to explore a career in Coaching. She is currently enrolled in a certification program and intends on starting her own coaching practice She loves hockey, all things British, and is working on her first historical fiction novel. Angie lives with her husband in Winnipeg, Manitoba, Canada. 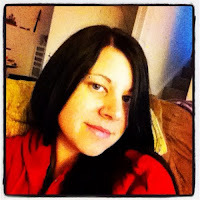 You can connect with Angiel on Twitter and her Blog. Thank you so much for sharing some of your awesome with us Angie!!! Thanks again Lillie for giving me this wonderful opportunity! Great post about you Angie, I need to take another look at my 22 Things soon...it's a great idea and I think I may even have done some of them! Thank you for helping point me in the right direction!! And, I also agree about believable characters. They are the ones that stick with you! Ohh big chocolate Hugs are the best! Thanks Ruth and Lisa! I thought I commented earlier! Wonderful questions Lillie! And Angie, I learned a lot about you through this :)) A very good idea all the way around! Wow, very cool! Thanks for this, Angie and Lillie, it's great to learn more about the people from our Twitter circle. Did you know you can get these AUTOMATICALLY AND ABSOLUTELY FREE by registering on Like 4 Like?